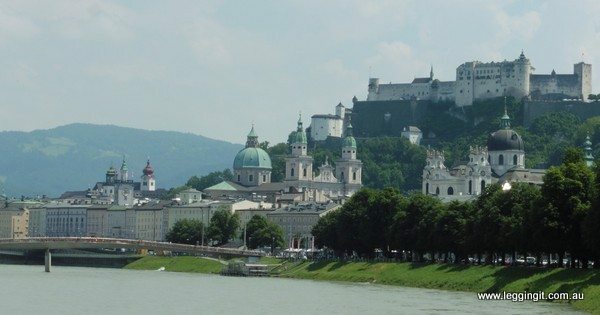 As we are around Salzburg for a week or so, we wanted to see some of the scenes from The Sound of Music. There are many options, bus, cycle or walking tour? We looked at the many bus tours but after seeing them all arriving in the one spot at the same time and offloading their passengers for a quick look then back on the bus, this went out the window. 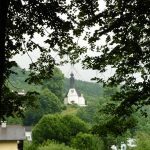 There is also a hop on hop off bus that will take you around the sights but the one that looked the most fun to us was Fraulein Maria’s Bicycle Tours. Sadly we could not manage to take a tour but we crossed paths with them a few times on our wanders and everyone looked like they were having a ball. For us we decided to follow a free tour we found on Big Boy Travel, we did not follow the whole tour as there were only a few places we wanted to see but you can find the whole tour here. Most of the tour can be done walking but they also include the buses you need to take so it is well thought out. It covers all of the filming locations around Salzburg. 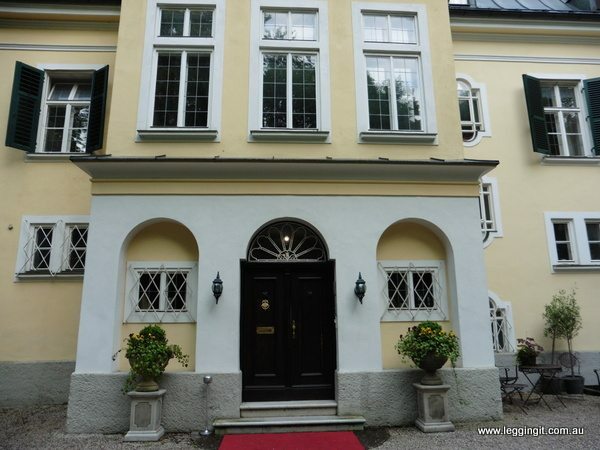 On our first visit to Salzburg a few weeks o we were lucky enough to stay at Villa Trapp, the real life home of the Von Trapps, which the movie is based on. Nowadays it’s a boutique hotel not far from the centre of the city. Whilst there we got to learn the real story of the Von Trapps and their escape. 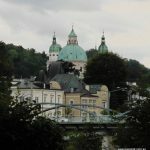 Being based out at Attersee we decided to start our self guided tour visiting the Basilica of Saint Michael at Mondsee. The twin towered church is set on the town square and is the perfect setting for a wedding. 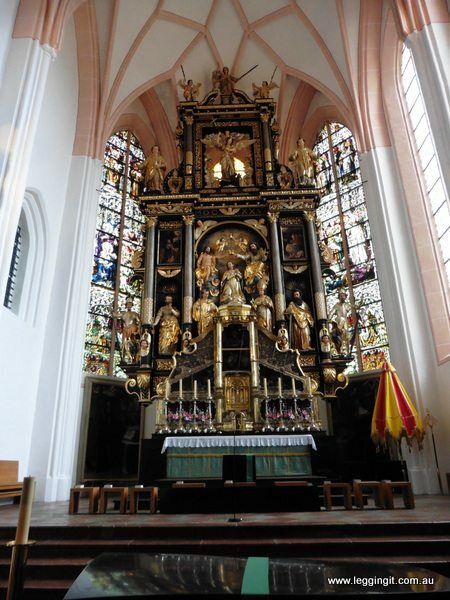 The Basilica dates from 1487 and has a spectacular baroque altarpiece dating from 1626. 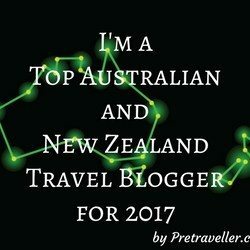 You can read about our interesting discoveries there in yesterday’s post. In real life Maria and the Captain married at Nonnberg Abbey. As the Abbey wouldn’t allow filming the Collegiate Church is the scene in the movie where the Captain and Maria marry. 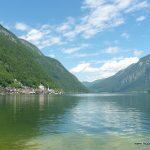 Lake Mondsee was also used for some of the scenery shots in the movie. There are some really beautiful views from Mondsee across the lake. We rode around it a number of times as we explored the area. We also visited Hellbrunn Palace,(Schloss Hellbrun) not far from the centre of Salzburg. At the eastern entrance to Hellbrunn Palace is the Sound of Music Pavilion. It’s the setting for the “Sixteen going on seventeen” song, which is sung by Liesl in the movie. 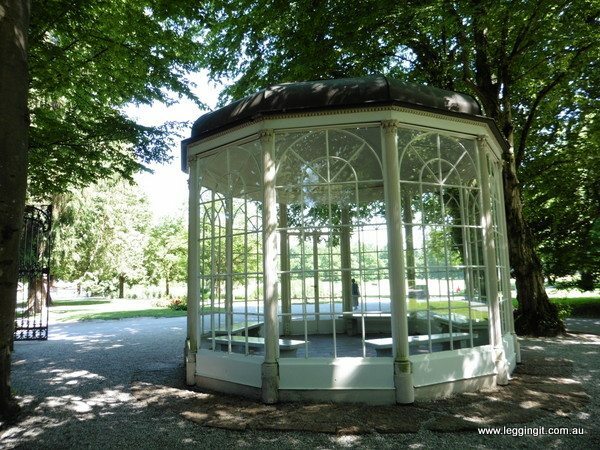 The Sound of Music Pavilion was originally in the gardens of Schloss Leopoldskon but was relocated. Unfortunately as there are so many visitors to the Pavillion it is now locked but Michele still had fun skipping around it singing. It’s located in the garden with free access. However, the rest of Hellbrunn Palace is not free. A few different companies offer a river cruise and entry to Schloss Hellbrun for around €20. So it’s not too expensive. The highlight of Hellbrunn Palace for most people, is the trick fountains. 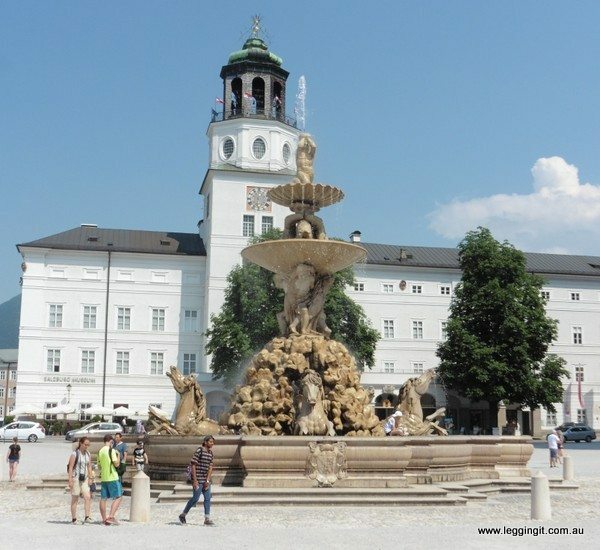 Not far from Hellbrunn Palace is Palace Leopold (Shloss Leopoldskon) which of course was where the Sound Of Music pavilion was originally located. Palace Leopold was built in 1736 in Rococo style by Bishop Leopold, and overlooks a beautiful tree lined lake. It was used to represent the Von Trapp family villa in the movie. The back of Palace Leopold is quite recognisable from the film, as many of the exterior shots were taken here. 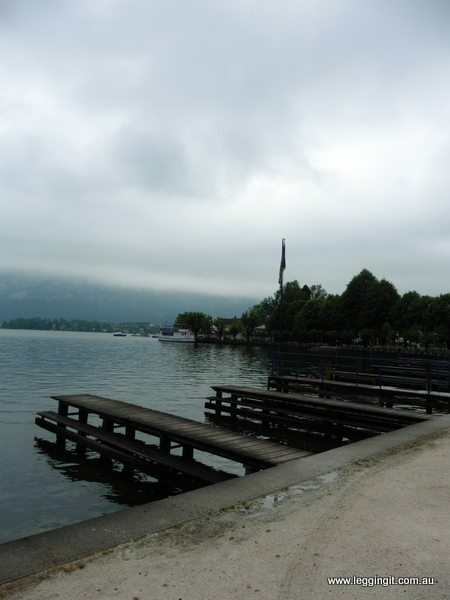 The scenes of the children falling in the lake and shots of the terrace overlooking the lake were filmed here. These days the palace is an expensive hotel so wandering around snapping photos amongst the guests is frowned upon. That said the view from across the lake is beautiful and a nice place for a break on one of the benches. 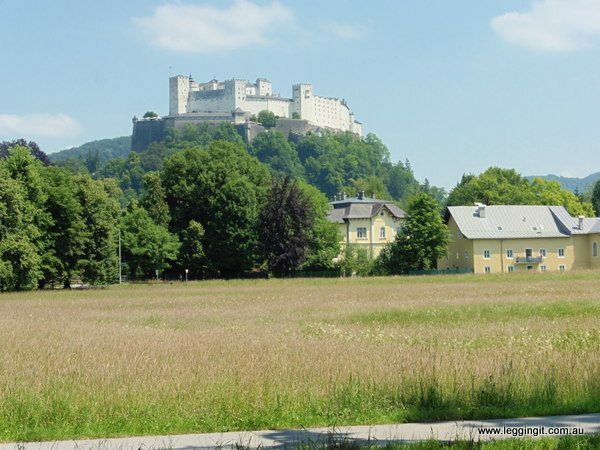 On a hill overlooking Leopold Palace is Hohensalzburg Castle which is one of the most impressive sights of Salzburg. It dates from 1077, although most of the walls were constructed in the 1400’s. It’s location gives it a view over the whole city and is also a great backdrop for photos. We continued our tour at Mirabell Palace, located on the north side of the river. Mirabell Palace was built in 1606, although it has been remodelled a few times in baroque style in the 1700’s and neoclassical style in the 1800’s. 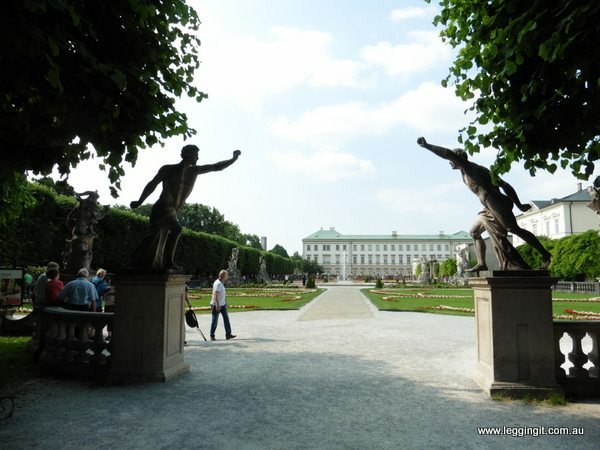 The gardens which are one of the most important feature (for film lovers) were established in 1730. Fans of the film will recognise that the Song Do Re Mi was filmed in the gardens. The children all dance around the Pegasus fountain before hopping up and down the steps to the rose garden. Of course whilst we were there fans spontaneously broke into song as they stepped up and down the stairs. Nearby the Pegasus fountain a set of stairs lead to the bridge connecting the Dwarf Garden. It was also featured in the film with the kids all dancing about patting the gnomes heads. The garden was hosting a wedding reception and they must have been most annoyed with all the tourists snapping photos around them. 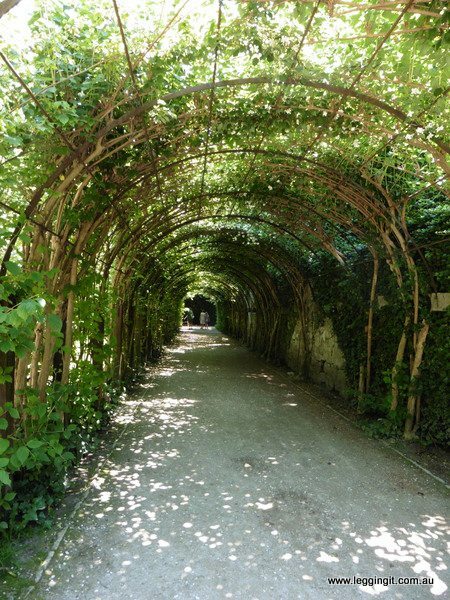 Also in the gardens are the vine tunnel and hedge maze from the song. At the entrance to the garden two Greek statues with fists in the air seemed to attract every man and their dog to strike a pose. 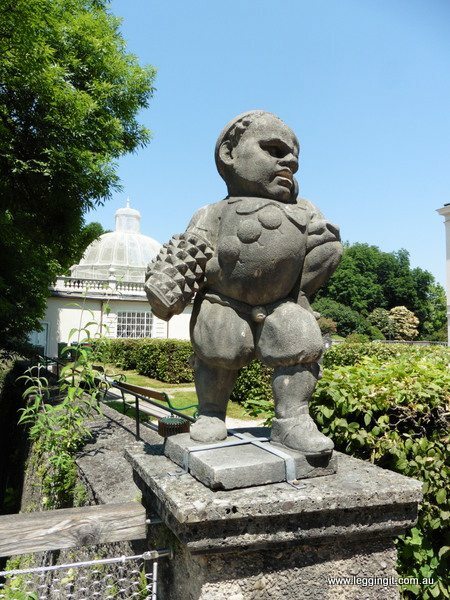 The gardens at Mirabell Palace were free and apart from the Sound of Music connection well worth a look around. 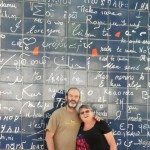 After spending close to an hour wandering through the gardens we crossed the river and took a walk along the riverbank towards the old city. However, we didn’t use just any bridge we crossed the river via the Mozart Footbridge. The bridge was built in 1903 in honour of Salzburg’s most famous citizen (well until that time). The Mozart Footbridge was the scene in the movie where Maria and the kids cross over singing “Do Re Mi”. The kids also skip along the grassy bank of the river during the song “My Favourite Things”. 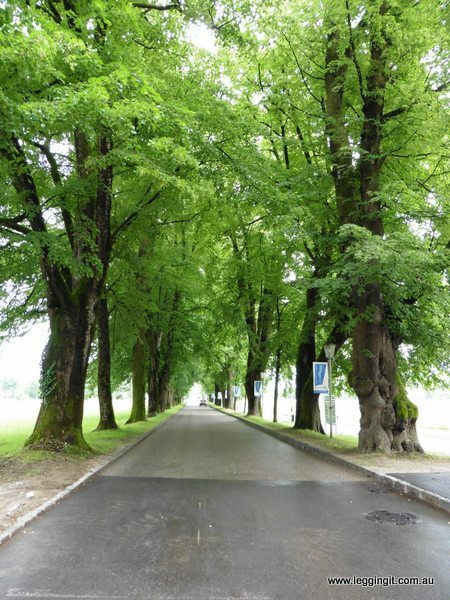 The tree lined south bank of the river is just beautiful and so relaxing to walk along. 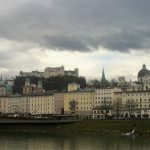 It was beautiful enough to make Michele declare that Salzburg is her new favourite city. In the centre of the old city it’s quite easy to find the Cathedral. Just look for the spire. It was our next stop on our way to the Pferdeschwemme (Horse Fountain). The horse fountains were featured in the film with Maria and the children dancing around them singing “My Favourite Things”. The horse fountains were used to bath horses in the Middle Ages. These days there are lots of horse carriages doing tours around the city. In Herbert von Karajan Square next to the Cathedral the second horse fountain, the Kapitelschwemme is located. Around it dozens of horses and carriages waited for tourists. 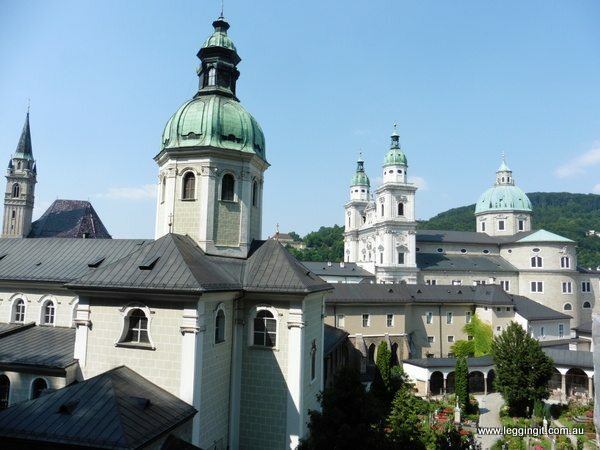 The Salzburg Cathedral dates from 1628 and in its baptismal font Wolfgang Armadeus Mozart was baptised. 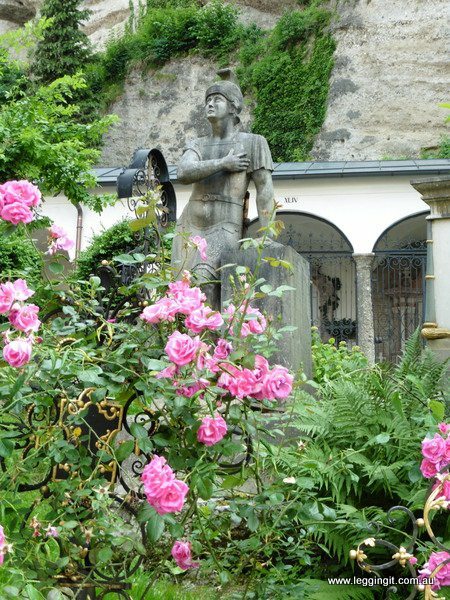 Most Salzburgers claim him as the number one visitor attraction of Salzburg, but we know the real truth. The Cathedral was remodelled in Baroque style in the early 1600’s and much of what is visible is from that time. Surrounding the cathedral are Domplatz and Residenzplatz. Around here a few of the scenes from the Sound of Music were also filmed. Maria walks through the arches of Domplatz towards the horse fountains. In the film Residenzplatz was the setting for the song “I Have Confidence In Me”. The Residenz Palace which fronts the square was draped in a huge Nazi flag in the movie. Our last stop on our self guided tour was St Peter’s Church and cemetery. The beautiful little church and cemetery were the inspiration for the scene in the movie where the Von Trapps hide from the Nazis. However, the actual scene was filmed on a film set in Hollywood. The graves in this beautiful little cemetery are covered in quaint little flower beds and many are decorated with ornate crosses. Plots in the cemetery can only be rented for ten years at a time. If the relatives of the deceased fail to pay then the body is quickly dug up and returned to the relatives. Here are no unloved graves in this cemetery. Attached to the cemetery is the catacombs which date back to 215AD. The catacombs are carved into the rocks above the church and consist of 2 small chapels and a vault. In the vault Mozart’s sister and Johann Haydn are the two famous guests. Entry to the catacombs was €2 but even at that price it’s a bit of a ripoff as there’s nothing really to see. Despite this there is a nice view over the church and cemetery about halfway up the stairs. As we headed for home on the bike we passed Frohnburg Palace. The palace was used for the front facade exterior shots of the Von Trapp mansion in the movie. It was built in 1660 by the Prince Abbotts but these days houses students of the Mozarteum Music Academy. 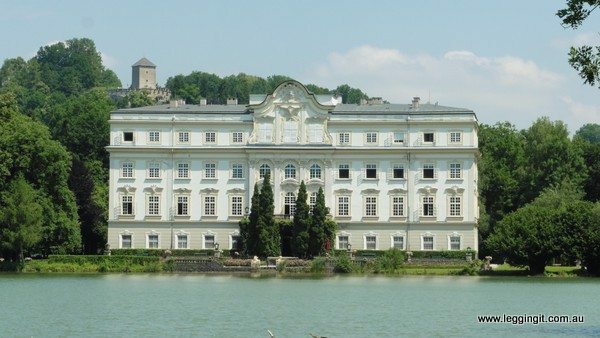 It was interesting comparing Frohnburg and Leopoldskon Palaces to the real Villa Trapp which we stayed in during our last visit to Salzburg. The whole fact verses fiction of real life compared to a film is remarkable. Villa Trapp is a little more modest than either of these palaces. 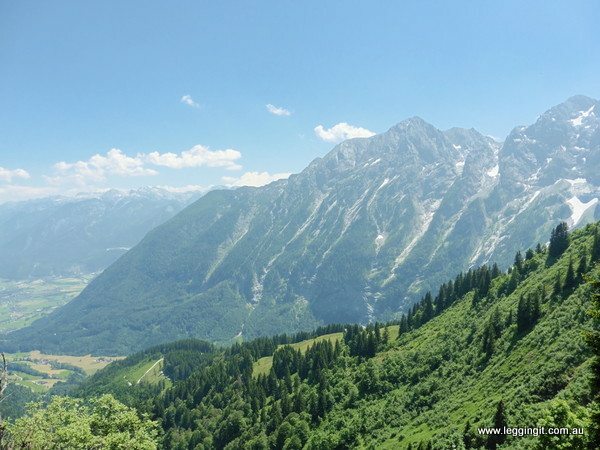 A few days later we were able to visit Rossfeld Mountain, one of the iconic places in the movie, just to the east of Berchtesgaden. In the movie the Von Trapps escape over Untersberg Mountain. As they climb they sing “Climb Every Mountain”. There’s an alpine toll road called Rossfeldstrasse just above Berchtesgaden which winds up through Rossfeld Mountains. The views from Rossfeldstrasse are quite spectacular and well worth the money for the use of the pay road. 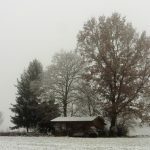 Rossfeldstrasse also has views of the Eagles Nest, Hitlers mountain retreat. 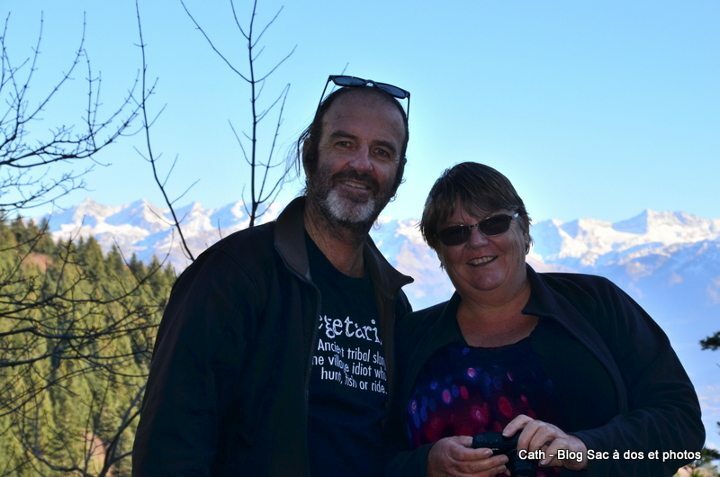 The self guided Sound of Music tour was great fun. It gave us a chance to visit all the places in our much loved movie. It was also great to visit the real Von Trapp family villa and learn the real story which is just as exciting as the Rogers and Hammerstein musical. 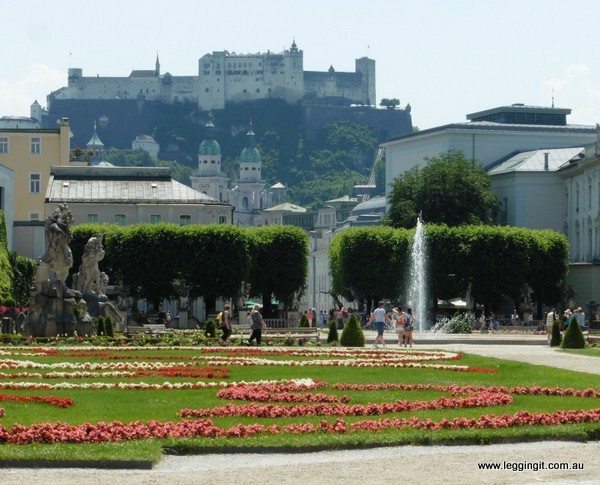 If you ever get a chance to get to Salzburg and you are a fan we recommend doing some type of tour and getting right into the Sound of Music feeling.